Unlike yesterday's, these photos really are from Varanasi. 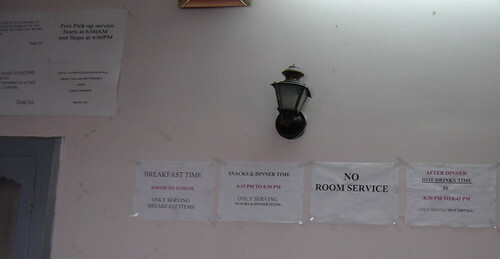 It's from the dining hall of the hostel we stayed at in Varanasi. Somehow I think all these times could have been boiled down a little better -- and I wish I'd taken time to avail the "Hot Drinks Time" -- all 15 minutes of it. At this place, room service would have been a problem in any case -- I don't think the stripped-down rooms had any phones.